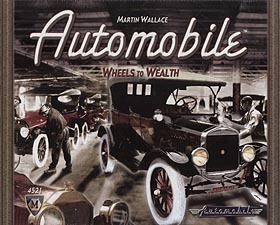 Automobile carries you back to the birth of the America's car industry, when inventors, craftsmen, and entrepreneurs created a wild array of marvels and misfortunes. You step into this rough, romantic trade hoping to create a fortune by building and selling cars. Tapping the talents of men like Ford, Sloan, Kettering, Howard, Durant, and Crysler, you balance quality versus quantity, mass production versus premium branding, and innovation versus distribution and aggressive sales. Lose your balance and you go bust. Strike the best balance, shift the right gears to best your rivals, and you'll be rich. You might even win. So, pull up your sleeves and start making cars!